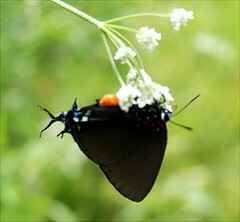 A couple of days ago, I was out on the land and I saw a really beautiful butterfly. The butterfly was very shy and I was hurrying to pick up G at school, so I only got a badly exposed out-of-focus photo. Even thought it was a crummy shot, the coolness of the butterfly was obvious. 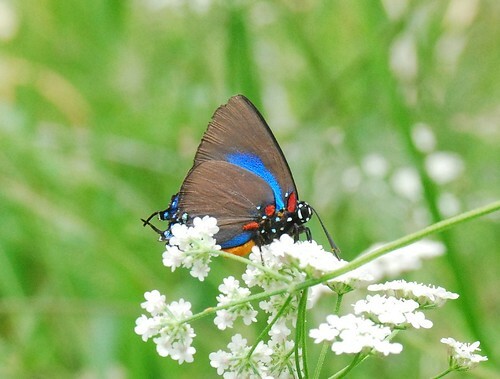 I was also excited because I knew it was probably a Hairstreak by the frills on the back bottom of its wings. I actually am succeeding at remembering what some of these critters are called. I still wish the focus was a bit sharper, but this guy is really cautious. If I see it again, I'll try laying in wait for it instead of chasing it around the field.